now silence in the autumn light. the signs where little hands did grow. till time demanded they depart. how parents hate for them to go? with lonely hours, routine pace. rewarded with an empty seat. no hug nor kiss come close of day. and time stops rushing by so fast. Poet’s Notes: When our oldest child went off to college, my husband and I felt a gap in the family almost as if someone had died. There was an empty place at the table, an empty room upstairs, and an empty swing outside. It was my husband's idea to focus on the swing. Editor's Note: My son never had a swing, a circumstance that I deeply regret. By the time I settled down and could afford a house of my own in Kansas, he was well into his teens--too old for such childish things. Two years later, he was off to art college, and now he's on his own. 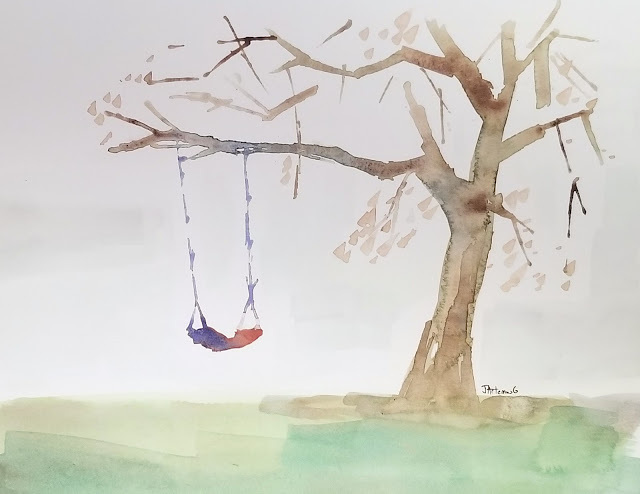 The only "silent swing" I have of his is the one above which he painted to illustrate this beautiful and moving poem.